Living out of two carry-on sized bags requires making some tough choices about what to bring. We can’t possibly carry everything. In fact, we can’t carry most things. But hard experience has taught us to make room for these often overlooked items. How else could we have saved these cookies? Russian nesting dolls have nothing on our backpacks. Unzip a compartment on any of our bags and you’ll almost certainly discover another bag. It’s quite possible that bag will contain even more bags. We have small ziplock bags and large ziplock bags. We have grocery bags, a laundry bag, a camera bag and a purse all stuffed somewhere in one of our four backpacks. We’re bag people. It’s true. And that’s because all of those bags come in super handy on the road. We use grocery bags for everything from cordoning off dirty laundry to shielding our electronics from the rain. We even sometimes use them for carrying groceries. 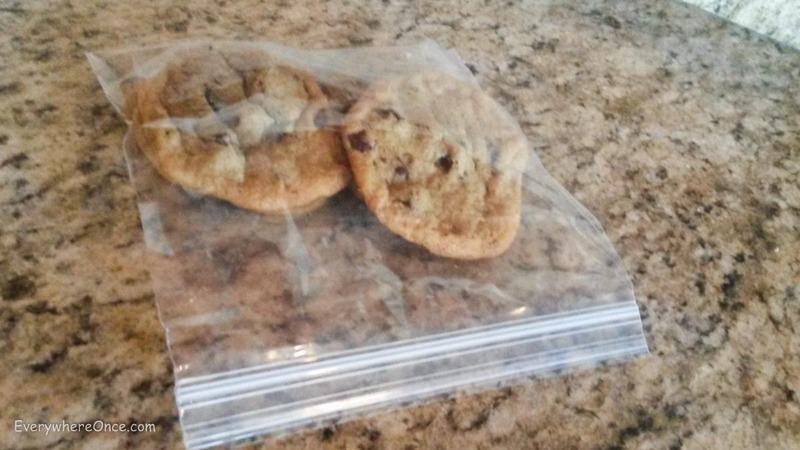 Ziplock bags, meanwhile, are great for organizing all the small stuff in our packs. Chargers, toiletries, first-aid supplies, outlet adapters, miscellaneous currency we may use again someday, and a whole host of other things are all nicely stored in their own little bags. Larger Ziplocks make great collapsible Tupperware. We use them for storing leftovers and saving unused cooking ingredients. We’ll use them to carry spices, store sauces, or to toss together some trail mix for a hike or a long bus ride. There really is nothing they can’t do. Whether we’re trying to block out the thrusting of airplane engines, the thumping of a nearby nightclub, or the thrusting and thumping of naughty neighbors, we’re always glad to have packed a good pair of sound-dampening ear plugs. You can’t really enjoy a sunset over the Seine without a bottle of wine. And you can’t really enjoy a bottle of wine unless you can open the freaking thing. True, you can try nudging the cork out by banging the bottom of the bottle with your shoe or use some implement to jam the cork down the neck, but where’s the romance in breaking into your vin like some desperate frat boy? We may be backpackers, but we’re not animals. Great TV? Don’t leave home without it. There was a time when cable television meant 183 channels of nothing to watch. Not any longer. 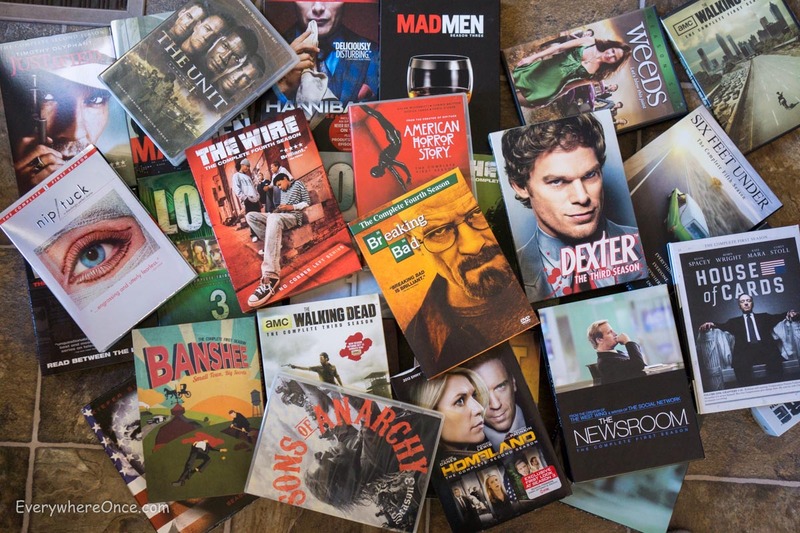 Today, we have exactly the opposite problem: too many great shows to possibly keep up with. We full-time travelers have an added challenge, though. 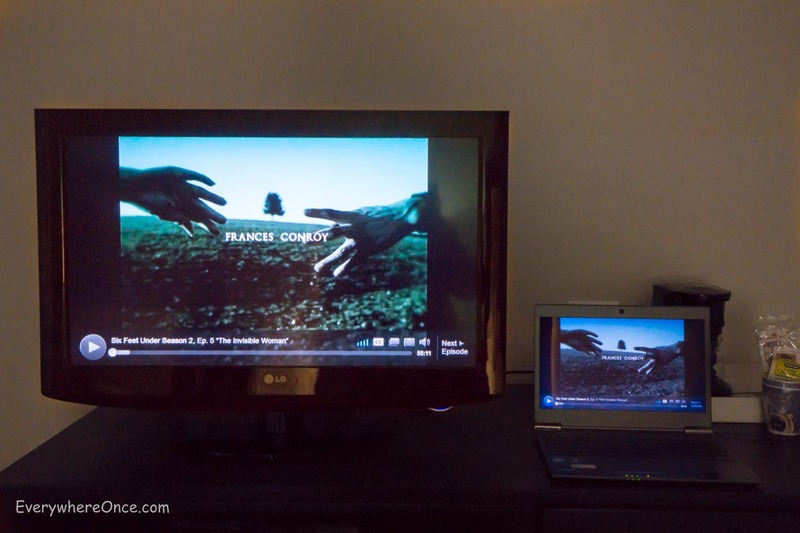 It’s often difficult or even impossible to watch American produced shows while traveling overseas. Streaming services like Netflix and Hulu and even the web pages of the big broadcasters like NBC don’t work outside of the U.S.
And although it is possible to trick these services into thinking that you haven’t left the country, that still isn’t a perfect solution for us. You see, we don’t always have internet access while traveling. No internet, no Netflix. And even when we do have wifi, it isn’t always strong enough to stream video. That’s why we carry ripped shows wherever we go. Before leaving our shores we stocked up on DVDs for dozens of T.V. series whenever we found them on sale. We then ripped each disk’s shows to our laptop hard drive using free open-source software called Handbrake. Now we have great T.V. wherever we go, wifi or no. Real TV deserves a real TV screen. Having great T.V. is one thing. But watching great T.V. is really the whole point of having great T.V. And doesn’t great television deserve a better platform for viewing than the itty-bitty screen and tinny speakers on our 13-inch laptops? We think so. And that’s why we pack an HDMI cable in our backpacks. With this magic wire we can connect our laptops to almost any digital television set and turn it into a giant computer monitor. That way we can play our movies and shows right from our computer and watch them on the BIG screen whenever we’re lucky enough to have one. We’d carry even more if we could. It’s going to be hard to get prescriptions filled on the road so we’re opting to bring as large a supply as we can with us. Most countries won’t honor prescriptions written by foreign doctors. And it’s illegal to mail them internationally from the U.S. So getting meds while away from the States could mean finding a local doctor to write you a script and hoping that whatever medication you need is available wherever you happen to be. That’s no sure thing. Better to bring what you need along for as long as you expect to be gone. Why on earth would anyone travel with a stand-alone GPS device when you can get great directions from your smart phone? Because smart phones become dumb bricks when they’re not connected to the interweb. For at least some of the time that we’re traveling and wanting directions, we either won’t get data reception or won’t have a data plan at all. 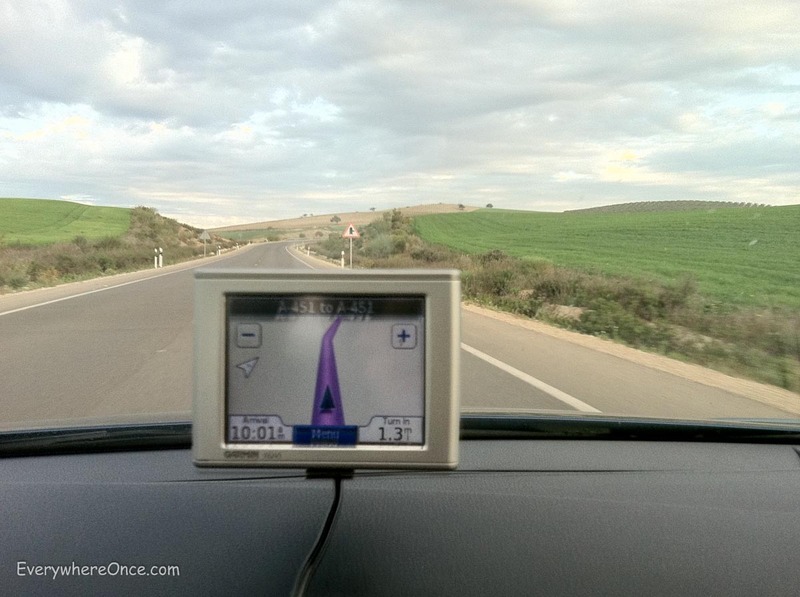 During those times (and really all the times in between), our trusty old Garmin GPS should get us where we want to go. Eventually we may be able to replace our GPS device with an offline mapping app for our phones. We’re going to test out several in the coming weeks to see how they do. If they work well, we could swap out our Garmin for an app. We’d be delighted to free up that room in our backpacks, possibly to hold some more bags. What “strange” things do you bring along on your travels? Having lived out of a motorhome was good prep for this. Less is more, but you are right, some things are indispensable. Even when I travel locally, I always carry extra medications and my first aid kit looks like something just short of a mini-operating room. Glad you are enjoying your trip! While you’re in Europe that shouldn’t be a problem. In fact, you could save a lot of money, most meds will be cheaper. I once filled three prescriptions in Italy for 11 euro (in 2008). The one prescription I have in the US is $140 without a drug plan. In the UK, even if you’re not on the NHS, it’s only 12 GBP. So I might do it to save the hassle, but I would check prices first. It’s probably true that it “shouldn’t be a problem.” But what if it is? Whatever we hoped to save on a script would be more than offset by the cost of airline tickets back home. 2a) How far in advance do we need to plan ahead for this appointment? 5) Hope that all of this can be done in the time set aside for this purpose – keeping in mind that it’s not really possible for us to reschedule appointments for the following week or come back in a month for follow-up tests, etc. Finding a doctor who speaks English isn’t a big problem unless you’re well off the tourist trail (or the expat trail) – I’ve seen doctors in Italy, an ophthalmologist in Georgia, and dentists in Poland and China plus had a broken wrist set in Switzerland, all in English. If the local hospital doesn’t work (no appointment required), the US embassy will have lists. If I’m going to Asia I take antibiotics and anti-malarials rather than buying them there, but I have a lot more faith in the European medical systems. But I do agree that if you have something chronic that requires tests for a prescription it would be more difficult. It’s not that we don’t have faith in the European medical system. We just don’t have faith that we’ll be able to walk into an unknown doctor’s office (or hospital), tell them what medications we want, and expect that they’ll be willing and able to comply. Maybe they will, maybe they won’t. Finding a doctor who speaks English. I think that problem could be rephrased in several ways. When I am abroad, I try to get closer to locals. Most times one or two speak English and can function as a translator. The best doctors are the local ones who are familiar with the local bugs and what have you. Another way is to learn the language of the country you intend to spend much time in. Spanish is a must, or French, or an Asian language if one goes into that direction to travel. In my opinion, it’s something people in North America will have to get used to: the world is not functioning around English speaking people. If not that willing to “go native” yes, bring your own medication, but it might not work for that local bug. I am pretty surprised that one would bring also DVDs and movies, as if there is nothing else to do when you are traveling. I give myself a vacation from the culture back home and are really “unplugged” when I am away. It is lovely. All the other tips I can appreciate, especially bags, I bring lots as well. And my camera cables and charger, not to be missed. And the prescriptions we need are not for local bugs, they’re things we take daily. I can’t honestly believe that you’re recommending that we needlessly risk miscommunication with our prescriptions so we can “get closer to locals.” That’s an astoundingly awful suggestion. We’re happy to deal with lost in translation scenarios when getting a meal. We’re not really willing to do that with our meds. We have had the most luck with asking the hotel to phone up the doctor. In France, Germany and Italy we’ve been sick. The doctor made house calls and was more than happy to write anything we asked for. I personally travel with a ton of antibiotics and ear drops for my chronic ear, but other things can happen. We also bring Pepto Bismol because it’s not available in Europe and sometimes Immodium is just too much. I totally get bringing movies. After 30 days of BBC in Italy and watching dubbed Clint Eastwood movies, I would have cheerfully watched Gilligan’s Island in English. We used to travel with clothes hangars, but have switched to braided cords with velcro and suction cup ends. Flashlights are good, power is not always reliable. So far your trip looks really good. Yup, that’s on a lot of people’s lists. I have to say, though, that I haven’t had a situation on the road yet where I would have used it. 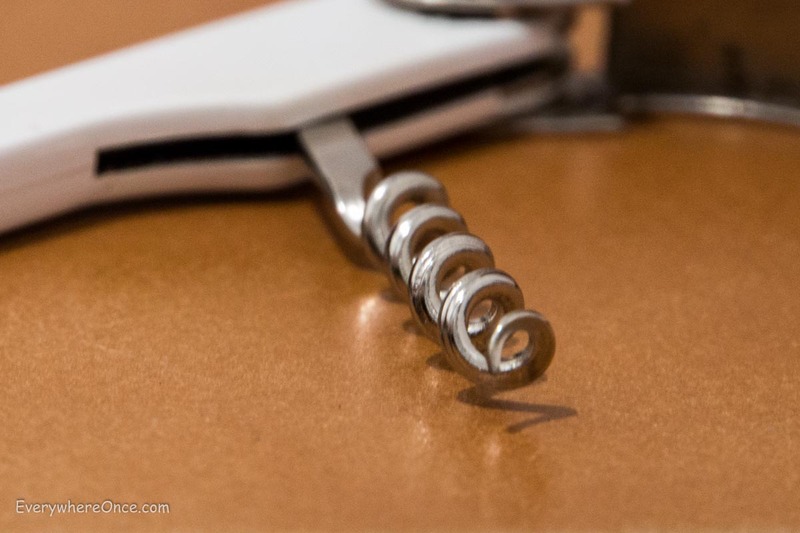 The corkscrew, I presume, is of the knifeless variety. I can’t tell you how many I’ve had to replace after the TSA confiscated the one I was carrying. I’ve even had the knifeless type confiscated: “That’s a weapon, sir!” Ugh! A gruesome one at that. Our experience is that TSA screening is pretty random with respect to what they let go through and what they don’t. Our corkscrew has a knife and therefore is technically “banned.” If they want to take it, that is their prerogative but they’ll have to find it first, and so far, they have not. can totally relate to your smartphone becomes a brick!! comment. I love that line, we’re travellers not animals. Very interesting blog, and always enjoy seeing the pictures and the lesser known spots. When you travel I find it is not only the big destinations that I remember ie the vatican museum, but I also always remember the walks and the cold cola in the small cafe while soaking up the day. I include a few other things in my packing, but an eyemask would be at the top. When combined with my ear plugs, I can sleep anywhere. Also: We’re planning on spending the year after next in Europe. Getting ADHD meds for my teenager will be challenging. We have eyemasks, too. We use them primarily on overnight flights and in Alaska when the sun never set. Two carry on bags? That is it? Sink stopper and elastic clothes line. Add to your excellent list: tiny flashlight. In some places, the power goes off all. the. time. I have been so, so glad I had my mini flashlight along. (fellow travellers would seek me out sometimes, knowing I always carried the thing). And: a washcloth. I used mine as a towel all during a trip through India. But even travelling domestically, it’s great to have a mini shampoo and washcloth to freshen up during a long layover. We carry a flashlight as well. Fortunately we haven’t needed it yet, but it’s good to have just in case. Another vote for the flashlight. Also for the universal sink plug, although I gave up on the clothes line as too difficult to attach and now travel with three lightweight plastic hangers. Also, a very small compass, useful in subway/metro/tube stations with multiple exits, as well as above ground when there’s no sun. And a dreamsack – http://www.yaladesigns.com/original-opening-dreamsack – takes up almost no room and comes in handy on night trains or when you have doubts about the bed linen. Agree on the compass. It can come in really handy in super confusing places like the Moroccan souks. I loved Handbrake for exactly the reasons you mentioned! However, I now no longer have a CD drive in my laptop so buying DVDs and ripping them just isn’t an option. I usually end up swapping media with other travellers to and from my external harddrive, and since I prefer watching shows that have already finished so I don’t have to wait week to week anyway, this works pretty nicely! Kind of like a book swap, neat. Although I wouldn’t rule out ripping DVDs. You can get an external USB DVD player for $15. Bags, definitely bags–the mesh variety, too. And amongst the compliment of electronics and cables I’ve found a multi-port USB charger wonderfully convenient for consolidating all the chargers that can charge from USB ports (which is just about all for us now). We found an awesome little 4-port USB charger on Amazon that comes with international plugs. I was still debating on whether to bring the ChromeCast, but you say Netflix won’t work in Europe?? Netflix won’t work in most of Europe. They have plans to expand here but I’m not sure if that means U.S. subscriptions will work or if you need a EU subscription. Either way, there is a work-around. We’ve already gotten a few questions on the subject so we’ll probably put up a post shortly with more details. Stay tuned. noise cancelling headset (Bose is my favorite), small cable lock (to secure pack etc. on short notice), athletic tape (superior to tensor for stabilization), Epipen (you never know how far you may be from a hospital), extra pens, eye drops (find airplane air very dry), saline spray (ditto), ricola throat lozenges (ditto), electrolyte tablets (nuun — easier, more compact than powder packets), travel toilet paper, “Go Girl” female urination device. The Epipen is something we intended to pack (although didn’t.) Had a scare in Guatemala with an unexplained allergic reaction to something I ate. Didn’t know I had a food allergy until that moment. Still don’t know what caused it. I got tested through my naturopath — 5 vials of blood in order to find both food allergy/sensitivities as well as anaphylactic reactions. Results were a huge surprise (unfortunately not all good). Also think I will request the dual injection Epipen if I know I’m going to be travelling far away from anything, as they will typically give you another dose once you reach the hospital. Love all the suggestions. I’m a Ziploc girl. So many uses, especially to pack up some snacks. A small collapsible back pack to use as a day pack is now in my suitcase. Wet wipes in addition to hand sanitizer (which I personally hate) or a wet cloth in a Ziploc. Pack a medical pouch with lots of band aids, hydrocortisone, antibiotic cream, blister pads, antidiarrhea drug, antihistamine and various pain meds. It isn’t always possible to take months of Rx pills as some (like thyroid meds) lose their potency. So far haven’t had to travel for months but feel your pain. Love your suggestions. I doubt you would ever get Netflix in Europe since we here in Canada cannot access the US Netflix because of the IP address. But you can usually get CNN! Ugh. We do have a solution. Hook up with a US IP address and we’re good to go. Some pay and others figure it out themselves. It has to do with licensing rights cross-border. Hope you got some good TV viewing!